I’ve done a fair amount of traveling over the past 10 years or so. And I’ve also learned a thing or 2 about how to make that travel comfortable and work for me. Lessons I wish someone had taught me before I had to learn the hard way. Besides that, airline travel has changed dramatically since 9/11 and continues to evolve so that your comfort and my comfort are not necessarily a high priority anymore. Having said that, I thought I’d share with you some of what I have learned over the years with the goal of your comfort being the priority! Let’s start with this one. Currently we are allowed one carry on bag and “something” that will fit under the seat in front of you. I struggled with this one for a long time trying to put things I wanted to use on the plane in my carry on and placing my purse under the seat in front of me. Then the light bulb came on……..finally. My carry on is my carry on and nothing more. 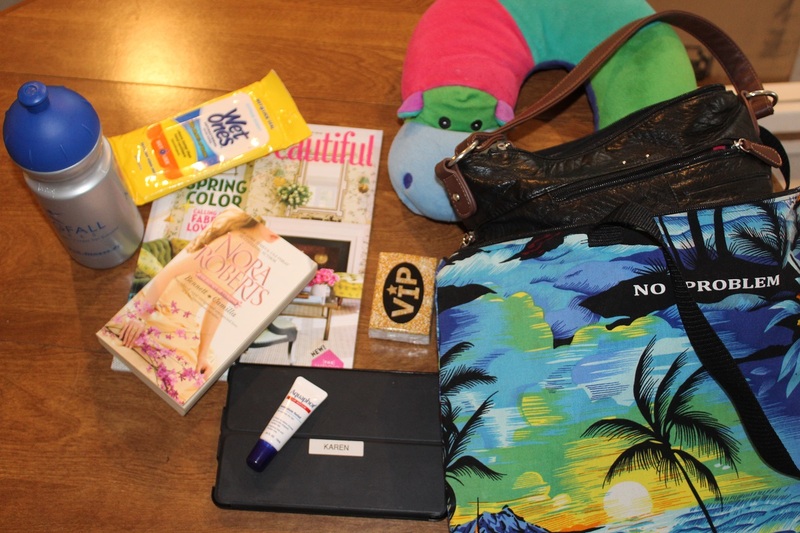 I finally learned to place my purse inside a tote bag along with everything I deem essential for a plane ride. That tote bag easily fits under the seat and I have access to all I need right in front of me. Here’s my list for that tote bag! Wet wipes antibacterial wipes. They don’t need to meet the 3 oz or less rule like a bottle of gel and are convenient to use. Wipe down that tray table and armrests. Take them to the rest room and use one on your hands then open the door with it! Lip Balm. The waxy “sticks” just sit on your lips. The one shown absorbs and smooths your lips. I love it. Airplane air is so drying that I apply it often. Kleenx tissues. No explanation needed and they are not provided by the airline. It’s always a surprise to find out if your airline has on board movies or not. My experience has shown me that even if on board movies are available, you needed to bring your own ear buds. Or, the equipment is broken. Or…….they do have in flight movies BUT you have to sign up with GoGoinflight BEFORE take off. My answer is to not stress over over it and bring my own entertainment. A magazine and a book are always in my bag. My Kindle goes where I go and I make sure I have uploaded a movie to watch and a book to read. A neck pillow. This is an essential for me, but not the one shown 🙂 My travel neck pillow has a snap on it which I fasten to my tote bag. This provides me with wonderful comfort while flying! I never, ever wear jeans on the plane. Too binding and constricting. Instead invest in a good quality pair of elastic waist knit slacks. The worst flight I ever took was when I wore jeans. Just no way I could get comfortable and for some reason the airline frowned on me taking them off! I love the ones I get from Landsend. Wide band elastic waist. Never baggy or loose their shape. Medications ALWAYS go in my carry on. In addition to prescribed medication, I take Benedryl for allergy and /or sleep. An anti-diarrheal like Lomotil. And just the opposite….a mild laxative like Correctal. Hey…travel can and does mess with your system. I also take a medication to treat cold symptoms like Dayquil. A roll of TUMS takes very little room and make just save the day. As does any jewelry. I never, ever take anything but inexpensive costume jewelry with me. What’s the point? I’m not there to impress anyone but to have fun! About that carry on: Mine contains 2 days worth of clothing from undies, to a dinner dress and everything in between. If your main suitcase is lost, you’ll be happy you packed smart. If I am going to Jamaica, that carry on has a swimsuit, T-Shirts, sandals and shorts. If I am going to Budapest, it has jeans, slacks, comfortable shoes and 2 nice knit shirts. I have found the very best way to enjoy a trip/ vacation is to think it though beforehand and be prepared. That way when you arrive at your destination the fun can start and your worries are few! Today I wish for you journey’s that will open your eyes and eyes that will see the beauty of all the world! Thank you Karen, very good suggestions. I like to wear slip on shoes or sandals so I can easily take them off in the plane. It helps with feet swelling (and makes going through security a bit easier too). If I wear socks I make sure they aren’t tight around the ankle. I also like to carry a light jacket, sweatshirt or sweater because I am often cold in the plane and blankets are not always available. If you want a blanket be sure to grab one on the way in from one of the overhead bins. I’ve noticed that they tend to be closer to the front of the plane, not every bin has them, and that they don’t carry enough for every passenger. Nothing worse than shivering your way through a long flight. Great ideas Lin! Especially about the shoes. I should have mentioned NEVER wear boots when going on a flight. That’s a guarantee that at security, you will be required to take them off and have them scanned! Great advice! I don’t think people think of these items until they need it. I never thought about the wipes and I am a bit of a germaphobe! Hi Katie, Wipes are my best friend! I take 2 packs of them. One on the plane and one in my suitcase for the return trip.